In this Flash tutorial you will learn how to create a gun shot text effect. The results give the effect of text decreasing in size. This tutorial is similar to the drop text effect tutorial and is fairly complicated so be sure to read it a few times, before attempting. Open a new flash document and set the frame rate to 15fps. Select the text tool and type your message on the stage. I used impact font type, but you can use whatever font type you wish. 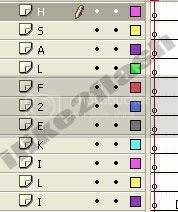 Select the selection tool and starting from the first letter, right click and select Distribute to Layers. Repeat this for all the letters. You should now notice that the timeline has a single letter on each layer. You can now delete “Layer 1” on the timeline. Select each letter in turn and convert it into a symbol by pressing F8. Give your symbol an appropriate name, check movie clip and click ok.
On the timeline select your first letter layer and insert a key frame (F6) at frame 5 and 10. Select the key frame at frame 5 then select the free transform tool (Q) and drag the letter, so that it is slightly larger. Now right click anywhere in between the 5th and 10th frame and select create motion tween. 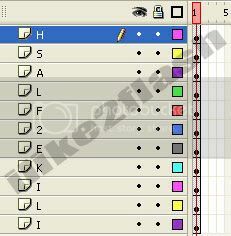 On the timeline select the second letter this time and insert a key frame (F6) at frame 15 and 25. Again, select the key frame at frame 15 then select the free transform tool (Q) and drag the letter, so that it’s slightly larger. Now right click anywhere in between the 15th and 25th frame and select create motion tween. **Note: I have filled in the empty black frame by pressing F5. On the timeline select the new first key frame of the first layer. And using the selection tool (V) click the letter on the stage and change the alpha colour to 0%. You should now have a gun shot text effect. Tutorial is nice. I have done exactly till step 5 and from the step 6 which says to delete the first key frame. Please tell me how to remove the first key frame. I am new to flash and using flash cs4. Select the first frame with your selection tool and hit the delete key on the keyboard. Thanks a lot. I worked now. Nice tutorials. I understood everything up until the optional step '7'. I couldnt figure out how to get the alha colour to change without clicking the actual letter in the 'later' frames. [Using CS3 and CS4 if its any help to know]. You select the layer on the timeline then the letter on the stage.